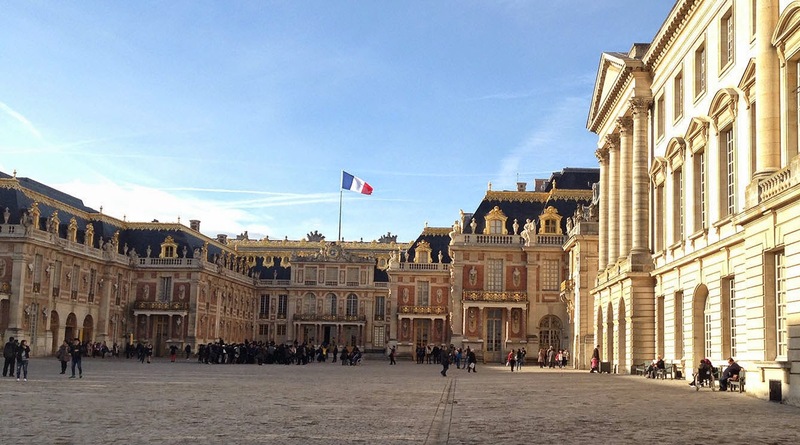 You may have heard that Versailles is the biggest and most spectacular palace in the world. And you may have heard that the palace gardens are one of the landmark examples of European gardening, full of fountains, statues, reflecting pools and manicured hedges. But maybe you haven't heard that the gardens are free, and open to the public every day from 8 a.m. to 6 p.m. And they are actually quite easy to get to, using the Paris public transport network. So, if you're in Paris and have time to get to the gardens in time for a run before the park closing time, take my recommendation: just jump at the chance! You will get a close-up view of the palace and then explore the vast gardens to an extent that few of the other visitors can. The gardens are very formal and detailed close to the palace, but get more natural as you head westwards, further away. You will even find yourself running past vegetable fields and sheep pastures at the furthest reaches of the grounds: quite a contrast to the manicured environment around the main buildings. So, if you'd like to try the Versailles Challenge, just jump on one of the commuter trains of the RER "C" line, heading towards St. Quentin or Versailles itself. The SARA and VICK trains all stop at either the Versailles Chateau station or the Versailles Chantiers station. 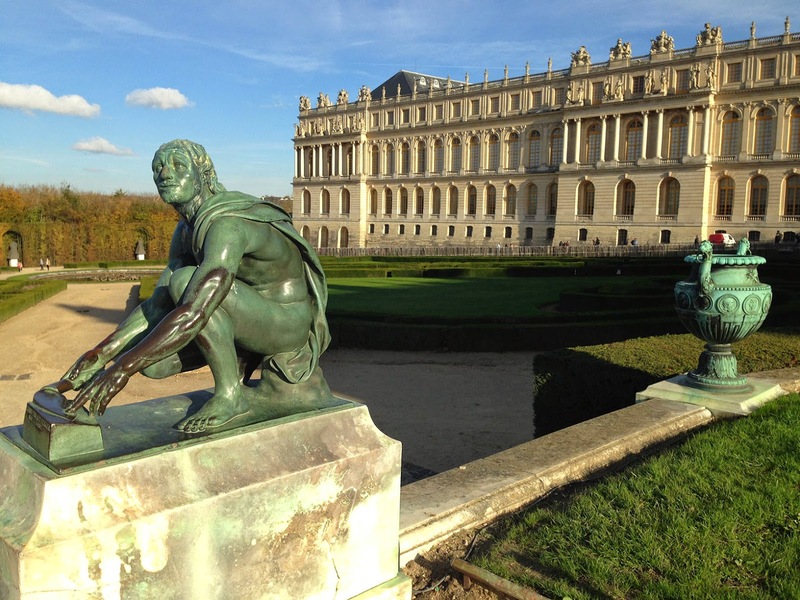 The two Versailles stations are just a few blocks apart, and a short walk from the palace. The current Metro price from the city is €3.50. To take on this very contrasty run, get yourself to the corner of Avenue de Paris and Avenue du Général de Gaulle, at the Versailles city hall (Mairie). This is just a block north of the Versailles Chateau station. 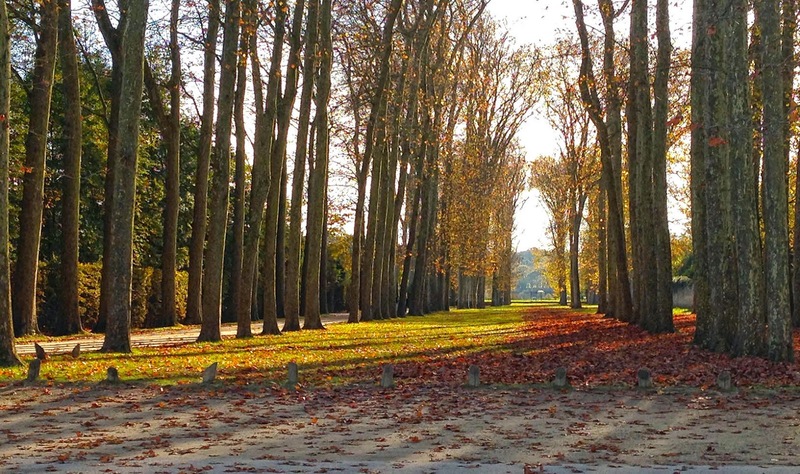 The tree-lined Avenue de Paris is the main boulevard leading up to the chateau, just two blocks away. The town itself is elegant and worth a visit in its own right: set up by the king to house government offices and employees, and it was the French capital for 100 years. It's a lot like Berlin's Potsdam: a pleasant, planned town created to provide a fitting first impression of the king's neighborhood. 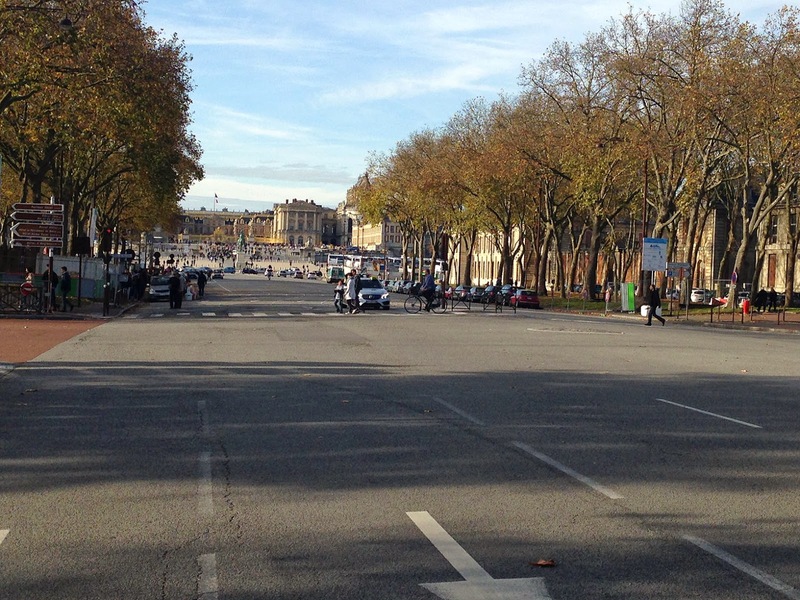 Standing at the corner, next to the mairie, turn west to face the palace a few blocks in the distance. Now run the two blocks to the big open, cobble-stoned plaza in front of the palace, now used mainly for parking. 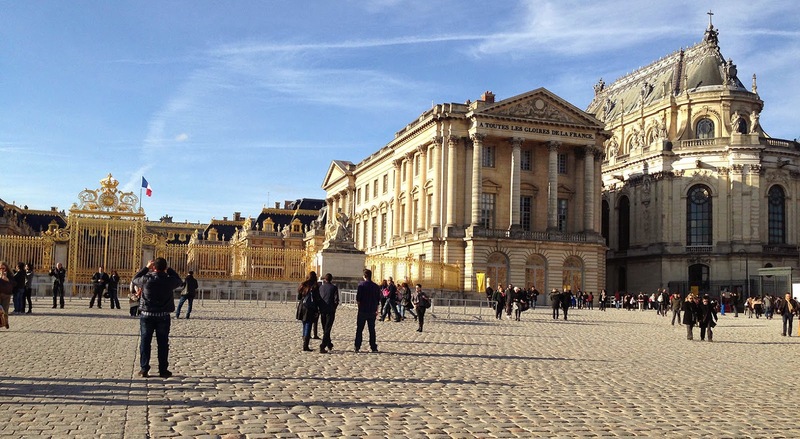 Run past the equestrian statue of Louis XIV, who built the palace, and head through the first, ornate metal gate. Now you run right up to the golden gate, where people buy tickets for the palace tour. There will be masses of tourists milling all over, but don't worry, it won't stay like this for long. The palace is one of the most opulent buildings in the world, with golden fences and decorations glittering in the sun, and imposing facades everywhere you look. So now, turn right and head to the alley to the left side of the ornate chapel, past the building with the inscription "A Toutes les Gloires de la France". Humility wasn't Louis' strong-point. This is the way into the gardens. Just run through the arched walkways to the gardens on the other side. There is a boarding spot right there for a little train that takes people on tours of the gardens. The people will still be pretty numerous here, but the gardens are so big that even here there is plenty of room to run past them. So now run to the backside of the massive palace, with its three wings. Past the little ponds behind the central wing of the palace, towards the left. There is a wide staircase leading down into the further gardens to the west. We'll basically follow a counter-clockwise loop around the grounds from here. There is a great view up there, and you just follow the walkways down past the clipped shrubs and statuary towards the fountains and lake straight ahead. 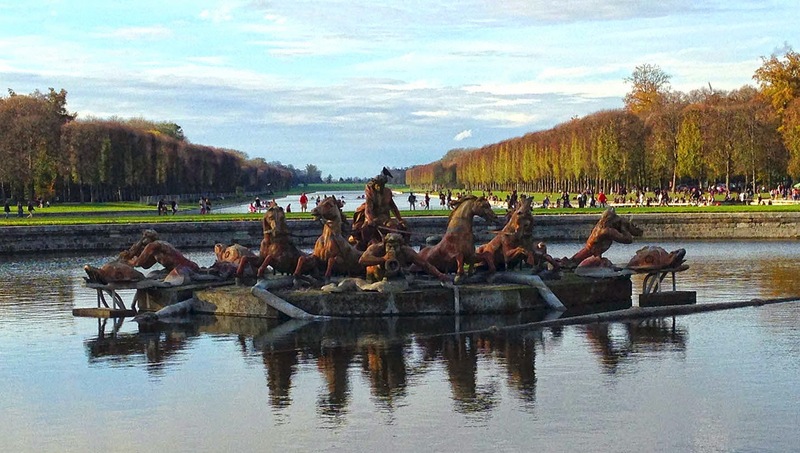 Next, you'll come to the Apollo fountain at about the 1.5-km mark, with the god driving his chariot horses through the pond. 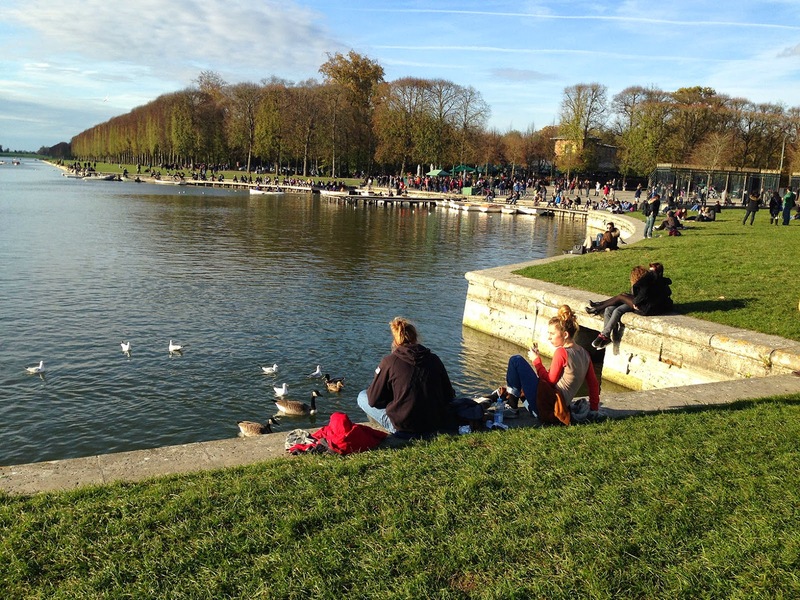 Immediately thereafter, the "Grand Canal" starts, a cross-shaped lake that dominates the park. To run in the gardens means having to run around the lake. You could just stay along the shores of the lake, running a cross-pattern, or follow the trails that connect the tips of the cross with each other, in a diamond shape, or loop around the outside of the whole grounds. This route combines a bit of each, but of course, you could do it any way you please. It's all good. To follow this route, head to the right side of the lake, where the café and the rowboat-rental are. This is the liveliest corner of the gardens, and the most fun place to people-watch. Just watch out for all the bicycles and rental golf-carts that vie for the walkways. 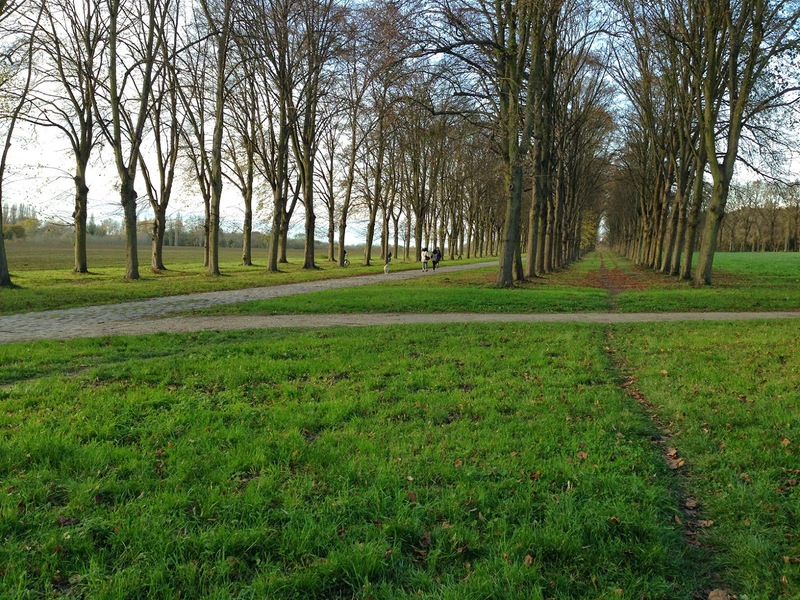 Run to the café, then -- immediately afterwards -- turn right to head along the Allée de la Reine, a quiet walkway with little woods to each side. You're now heading northwards towards Trianon Palace, the place where the king normally lived: homier and more livable than the gigantic main palace. The main building was used mainly for parties and receptions. 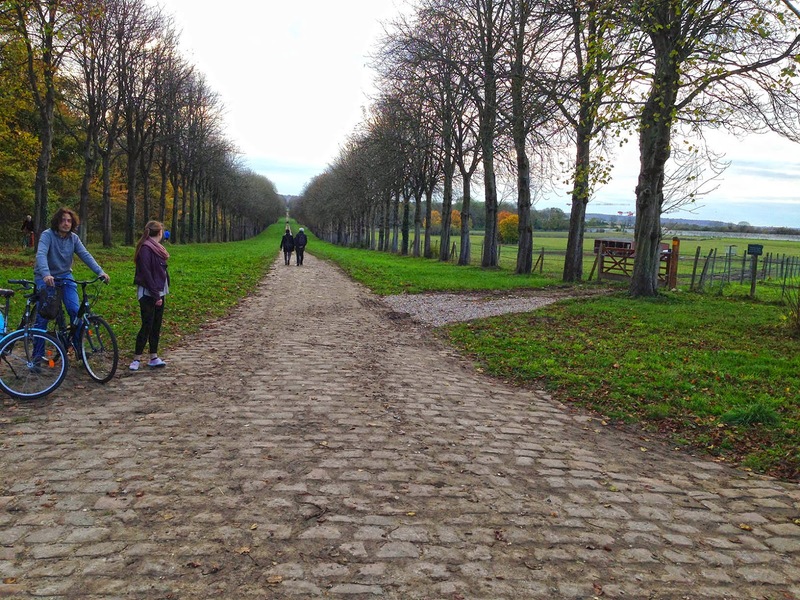 When you reach Trianon, just after the 2-km mark, take a look around, then head to the left. 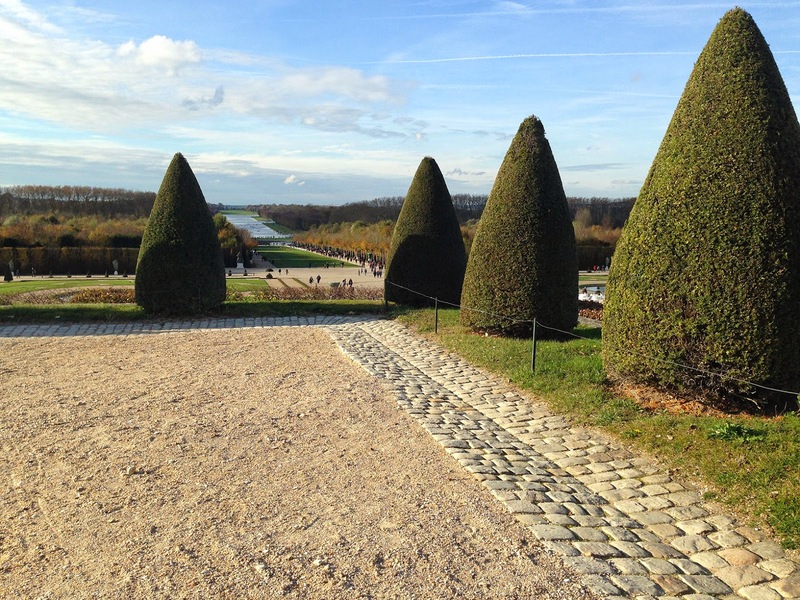 You'll now run downhill along the paved path called Allée de 2 Trianons to the northern point of the cross-shaped lake. 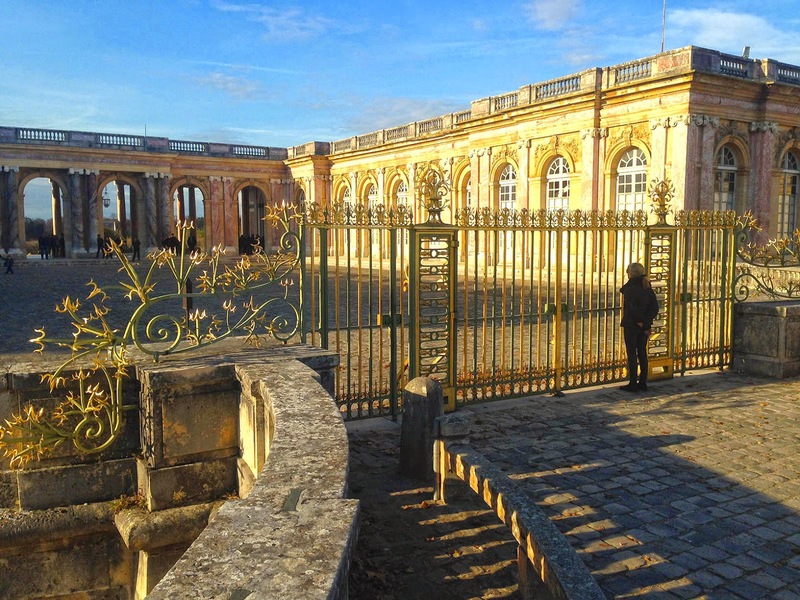 The walled gardens of Trianon Palace are along your right side, and woods to the left. 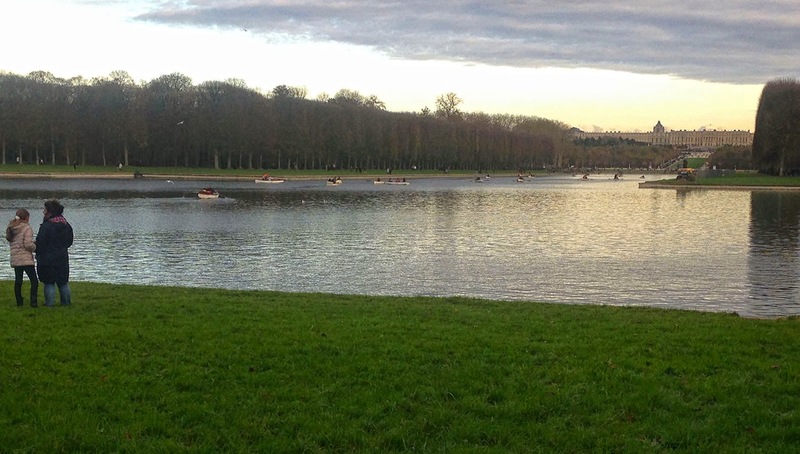 When you reach the water, keep heading west directly next to the wall, along Allée de Bailly. The main path is paved, but there is a little dirt path to the right side, next to the wall. The main path later turns to cobblestones and isn't very pleasant to run on. 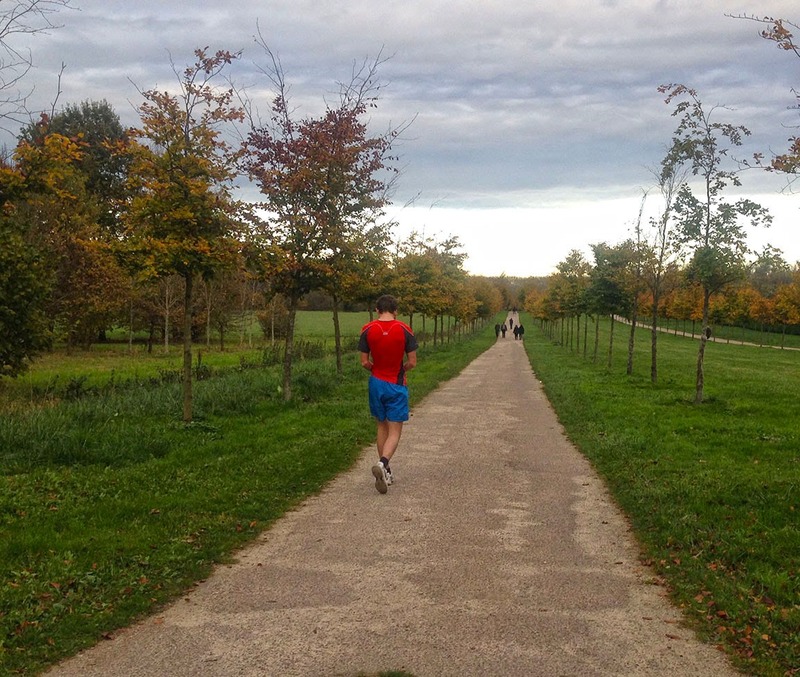 From now on, you will see fewer and fewer people: just a few hikers and bicyclists, and even a few other runners. You won't be the only person to be running the gardens. You will soon be running out between farm fields and woods. At the third turn-off to the left, where you will see a wooden gate to a horse pasture on the left, turn left onto the Allée de la Ceinture, at the 4-km mark. This is also just before reaching the stone wall along the west edge of the grounds, which you can see bordering the far side of the pastures. Now head southwards. Here, you'll also find a dirt path next to the cobble-stoned lane, along the left side this time. You'll head a bit downhill, with the horse pastures along the right side, and woods and vegetable fields on the left. There are also sheep pastures at the little farm buildings along the right, as it starts going uphill again. You will now come to the western entrance into the park at Grille Royale, to the west of the lake. Now turn left to run through the open lawns leading down to the lake, at the 6-km mark. Just follow the southern shore. Run until you reach the intersection of the cross, then turn right to keep following the water towards the south. Round the southern tip, at the 7.5-km mark, then take the diagonal path to the right, another lane called Allée de la Reine. This time you're heading towards the eastern tip of the lake, at the Apollo Fountain. This avoids the ever-growing crowds along the eastern edge of the lakeside. Once you get back to the eastern tip of the lake, just re-trace your original steps for the last two kilometers. You'll run back eastwards to the palace, head out into the plaza out front, then continue towards the east, along the Avenue de Paris. In 2 blocks you'll be back at the city hall again. Now that was a run with a lot of amazing variety!